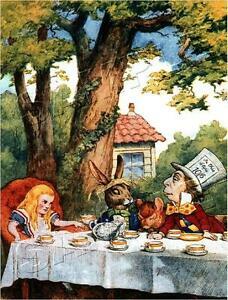 Print Type: Giclee, Iris Print Size Type/ Largest Dimension: 8.5" x 11"
It features Alice at the Mad Hatter's Tea Party. "Mad Hatter's Tea Party". ~ Victorian Art ~. Looking for more VICTORIAN ART PRINTS?. printed on genuine canvas ! Finish included on each canvas art print!